Some animals have eyes bigger than their bellies. Check out these crazy animal images of snakes that tried to swallow something too big for their stomach! Snakes are some of the strangest animals on the planet. They have no legs or arms but are very successful predators. Snakes do not chew food, they have jaws that unhing so that they can swallow their meal whole. Sometimes however they overestimate what can actually fit in their gut and this can have fatal results as you can see from the examples below. African rock pythons are the biggest snakes on the African continent. They can grow to 24 feet long and have been known to take on prey as big as crocodiles. 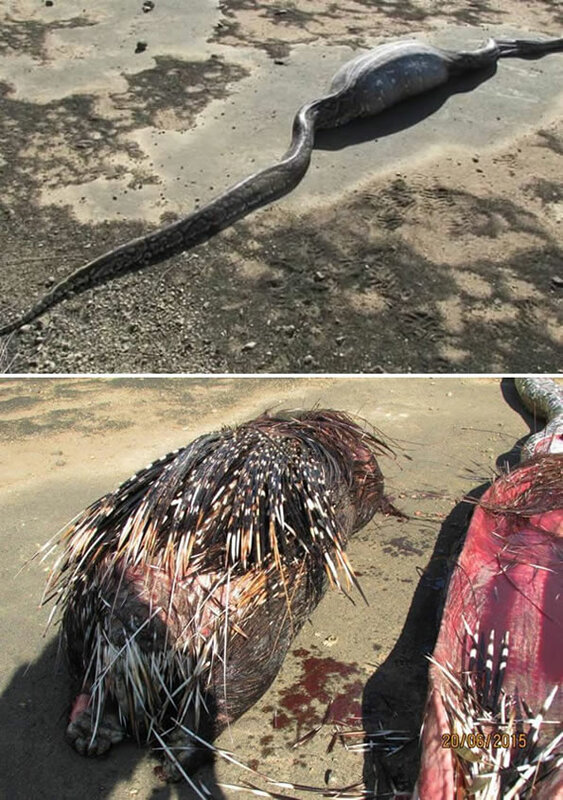 This snake tried to eat a porcupine. The spines pierced the stomach lining of the snake and killed it. The Everglades have been infested by giant Burmese pythons. These snakes can grow to 26 feet long and will take on anything in their path. This one however tried to eat an alligator that was simply too large to be digested. As a result both beasts died. This small but deadly viper packs a big punch. But after biting and eating this giant centipede which is also very poisonous. The prey bit his way out of the stomach of the snake killing it but it died as well before it could get out of the snakes belly. Some animals eat like a pig… well this snake ate a pig. However the pig was simply too large for it to digest so it ended up dead as well.